Family Life is a magazine published by Pathway Publishers of Aylmer, Ontario. Family Life features stories that teach morals, pieces on Amish history, articles discussing faith issues and challenges to living a Christian life, parenting, medical advice, as well as uplifting poems and drawings. Family Life’s editors produce much of the content, but also publish a large number of reader contributions. Letters from readers and notes from the editor are included as well. Readership is Amish and Mennonite, and also includes readers from outside Plain circles. Subscriber totals exceed 30,000. Family Life has a plain appearance, and is printed in black-and-white. 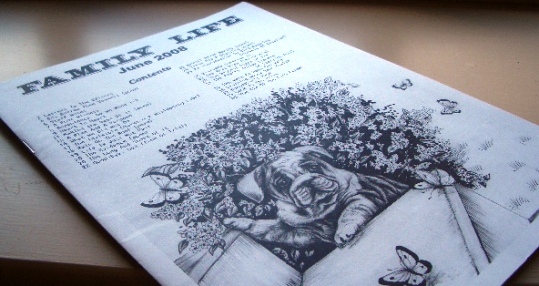 The cover features a hand-drawn illustration, as well as that issue’s table of contents. Along with Family Life, Pathway publishes 2 companion publications, Young Companion and Blackboard Bulletin. Young Companion is addressed to Amish youth and examines issues of relevance to adolescents. Pieces in Young Companion often taking the form of fictional pieces that teach moral lessons, or advice stories from older adults. Blackboard Bulletin is a teacher’s publication and focuses on education. It is widely-read by teachers of Amish parochial schools. Since Pathway offers a package subscription deal, many Amish families receive all three. Price for Family Life is $11 per year for 11 issues (August-September is a double issue; price current as of November 2014). A year’s subscription to all three magazines can be had for the discounted price of $21. Be sure to provide sufficient postage as this is a Canadian address. Canadian subscribers should include 5% tax and can pay in Canadian funds (US subscribers must pay in US funds). It costs $1.15 to mail a 1-2 ounce letter from the US to Canada. The Sugarcreek, Ohio Budget has been published since 1890. The Budget comes in two editions: the Local Edition, and the National Edition. The National Edition has as its motto “Serving the Amish-Mennonite Communities Throughout the Americas”. The National Edition consists primarily of letters from mostly Amish and Mennonite “scribes”, who write in to report on local happenings. Topics covered by scribes include births, deaths, weddings, visitors, the weather, the state of crops, and so on. The Local Edition consists of the National Edition, along with additional coverage of area news. The Budget phone number is (330)852-4634, and the fax is (330) 852-4421. Once placing your order, it takes 2-3 weeks to receive the first issue. Individuals wishing to try a sample issue of The Budget can do so by sending $4 to the above address. Raber’s Bookstore, located in Holmes County, sells a wide variety of Bibles, German language books, Bible stories, Christian and inspirational books, books written by and about the Amish, and hymnals. The 2010 catalog, for example, includes Egermeier’s Bible Stories ($17.95), the Ausbund songbook ($7.50 for the standard version; $22 for “Ausbund Translation”), and McGuffey Readers ($9.95-12.95 per volume, or $77. 65 for the set of 7). 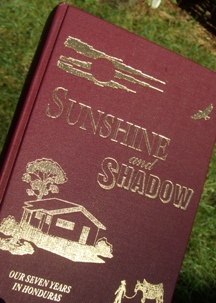 You can get a Martyrs Mirror for $40, or the book Sunshine and Shadow, an account of an Amish attempt to settle in Honduras in the 1970s, for $9.50. If you’re in the area, you can also drop in to the bookstore at the above address. When I last visited Raber’s Bookstore in April, Aden and Mary were in the process of expanding to a new facility, much larger than the current store, which is/was housed in a converted milk house. The new building is located at the same location, but will have much more floor space. There are a number of other newspapers and publications produced and read by Amish and Mennonites. These include Die Botschaft, Die Blatt, The Diary, Plain Interests, The Fishwrapper, The Pinecraft Pauper, and others. Other Amish bookstores and publishers include Gordonville Bookstore and Print Shop in Lancaster County, PA (275 Old Leacock Rd. Gordonville, PA 17529), as well as Pathway Bookstore, a branch of Pathway Publishers, in Lagrange County, Indiana (2580N 250W LaGrange, Indiana 46761). I have at least two Amish relatives that run successful publications. My cousin’s husband is the publisher of Plain Communities Business Exchange, a business-oriented newspaper that has around 6,000 subscribers. Wie kann ich die Deutsche Druckschrift bekommen? I would like to get a subscription to the Ladies Journal. Can someone put me in touch with the lady who publishes it? Mike, thanks for reminding me about Plain Communities Business Exchange, should have added it to the list. Great publication. Hello Erik on this Labor Day. Do you also know about the magazine “Keepers at Home”? I have subscribed for a couple of years. Hey Ann, hope you are not laboring too much today yourself! Thank you for posting the info for Keepers at Home. I am familiar with it and know that it is popular in some Amish households but haven’t had a chance to read it much myself. For that matter if anyone else has subscriber/contact info for any publication I’ve missed here, please post! Five years ago I subscibed to the Budget. I expected more information about the Amish Community, but was disappointed. I am an ‘Outsider’ but respect the Amish life style and am very interested in the Amish. At times I wished I lived next to them. I did buy some DVDs about the Amish which was very informative. I also purchased some Amish photos from Bill Coleman. I am always interested in photos of the Amish, especially children. If any of you you have some additional information about the Amish let me know. The Budget is not really a guide to the Amish but rather a communication tool used by Amish. It allows them (and other Plain People) to exchange information and follow events occurring in other communities. So maybe that is why you found it lacking George. It’s a bit like tapping into a wide conversation, where the main topics are local events, the weather, etc. Erik, you would have the address to die Botschaft? I am a German woman of 46 years and would like to get a contact to an Amish woman who would like to write letters to me and whom I can write to? Thank you very much! I see forward to a letter! I am a 48 year old married woman. I have two daughters. I am seeking an Amish Female Pen Pal. I hope it is God’s will to make a long distance friend! Often with my group tours of Holmes county, I take them to “The Budget” in Sugarcreek. In a way, it is like “facebook” in print. I especially draw attention to Page 19. There is a section called, “Shower Section.” It highlights the special needs of the Amish in reference to medical and financial hardships. Example ~ “Let’s have a thinking of you and money shower for Dan Miller. He had an accident at work and will be out of work for 8 weeks. God loves a cheerful giver. Then if follows with who submitted the request and gives the recipients address. Since I just happened to stumble across this I’ll give you info for The Fishwrapper. Also be sure to check out our new book release – “Grand Ole Fishwrapper Stories – Volume 1” This is some of the best stories from 1999-2003. I have a farm for sale in Ky that I would like to advertise to the Amish, what would be the best way, newspaper if so which one? Hi Clint, the Budget is one of the most widely read papers and may be a good bet. If no Amish live in your area already, it may be a challenge to sell to Amish, unless there is other land available where other families could settle as well and create a church. Erik, thanks for the info, I did put an ad in the Budget sometime ago but wasnt sure if that was the best place, and yes their is plenty of room here thousands of acres for sale including mine, some of the closest families are 15 miles from here. Please feel free to pass this info on to anyone looking for land I can be reached at my e-mail taborfarm@ymail.com and I will check this fourm. They do not accept credit cards-a check or money order is what they take. I just noticed my subscription expired so I better send them in a check. I would like to become pen-pals with others who enjoy learning about the Amish. I have a great respect for the Amish and Mennonite’s. If anyone would be interested in becoming pen-pals please write me at Aletha Lee 1909 Heckle St Augusta Ga 30904. I also subscribe to the LADIES JOURNAL and it is a nice magazine….lots of reading it it. May subscribe to the Florida paper or buy the book, can someone tell me a little about both? I think the Budget is a bit too expensive…..is there a way to get a complimentary copy, before subscribing…That’s why I subscribe to the Ladies Journal….I called and asked if I could get one and they sent me one…… then I subscribed…..
And does anyone know anything about “The Fishwrapper” paper ? Very interesting name !!! Do you have more information about the Ladies Journal? I could not find it on Facebook, and I also couldn’t find an address. Thanks! 1 year: $30, 2 years: $56. (Published 6 times per year). Canada and Foreign: 1 year: $42. 2 years $78 (US funds). Credit cards accepted. Make checks payable to Ladies Journal. I am fr.o.m. Sweden and very interested in all amish. Since I was brought up in a baptist home I am interested in our history, which is the same. Since I now saw that a LOT of the plain reda ladies journal I got very curious. Is it polisbilen to get one number sent to me, of course I pay for it? Maria I’m sure you’d be welcome to subscribe. But if you only want one issue, call the number above to see if that can be arranged. I don’t know if they only do single issue orders, but you can see there is a foreign subscribe option. The lady who runs the magazine is very nice. Thanks for the info. The Plain folk are so very honest when it comes to business. It was a pleasure to run upon your site. I’m Indian. I shall visit the US from 5th April to 30th June this year. I want to live in an amish community for some time. Kindly arrange to provide me information so that my dream is fulfilled! Is there any way I can get just 1 issue of Family Life to try before I subscribe? Am I able to subscribe to some Amish magazines if I love in Australia if so how do I do this please? Would there be any Amish women that would like to be pen pals with an Australian women that’s approx 39 years of age? Janine your best bet might be to give, say, the Budget a ring to see about international rates (330)852-4634. I know some, probably most of these mail issues to Canada, but not sure about further afield. I wanted to say thank you for providing this website it is very helpful. And I would also like to say that me and my family visit Berlin, Ohio and surrounding areas atleast 3 times a year. It is my favorite place to get a way and relax the atmosphere is just so peaceful there and when we visit I just feel so relaxed and peaceful and can forget about my problems for awhile. Also when I visit I never want to leave. God Bless. I am not sure how to say this so I suppose I will just say it. I am not sure those publications (especially family life and Keepers at home) are mwant for nonplain or non like minded people. I am not sure it is a good idea to put them on here. Sometimes people love the “charm” of plain life but the way we dicipline our children is different, the advice given about how wives should relate to husbands is different. The way we go about giving birth to babies is different. I get those publications and have for years. I appreciate their advice but a pperson who is not like minded is likely to absolutely throw a fit about Biblical submission or spanking of children or children giving their wages to their parents when it has been a part of this community for years. I can just see these publications getting into the wrong person’s hands and causing a huge huff. Stephanie I appreciate your concern but I don’t think there is any need to try to “hide” these publications, nor could we if we wanted (info is online elsewhere). People who are like-minded are the ones who will order these, and they’ll get good upbuilding resources for their homes. Those that aren’t simply won’t “get” them, literally and figuratively. What I’ve noticed is that people can get in a huff about nearly anything nowadays, and let them if they want…though I don’t think there is anything objectionable here–just ideas that have been around a long time and content coming from those of a traditional Christian mindset. I totally agree Eric. Most people who will order these would be like minded. I certainly do not want to hide these publications as some of them have been a great help to me. I guess I was speaking og those few who want to “glimpse into the lives of the Amish” by buying these. When they see things like birthing questions or natural remedies for children or advice to spand they *do* get in a huff. I had one lady (upon receiving Family life) tell me she thought Anabaptists were nonresistant. Then why do we “beat” our children ugggh. I get what you mean Stephanie. Spanking is a controversial subject nowadays. This is probably a case where the Amish of today are in fact more aligned with the norms of a generation or two ago. In the Feb. 12 edition of The Budget, the editor wrote a report on 2 about The Budget scribe (local writers) annual gathering at Pinecraft, Florida. Very interesting report which gave names of attendees from at least 14 states and several locations in Canada. The report also stated that there are now over 900 scribes, and average number of letters processed per week is 565. Seems like The Budget is doing fine!